Apple is beefing up the security of its iCloud and Apple ID accounts by adding two-factor authentication to the account login process. Users who activate the option will be required to enter a four-digit code they may receive via SMS message, aside from the usual password. Two-factor authentication is gaining popularity because it makes login to online services significantly more secure compared to regular process. Apple has rolled out this functionality for Apple ID and iCloud users. 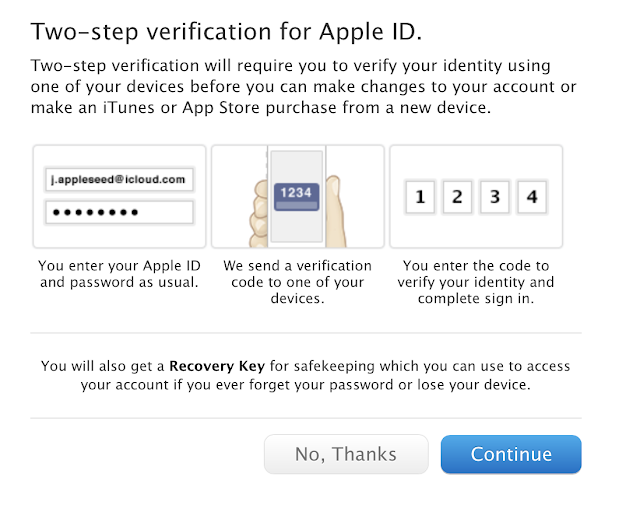 "Turning on two-step verification reduces the possibility of someone accessing or making unauthorized changes to your account information at My Apple ID or making purchases using your account," Apple said. Apple will be using both the app and SMS versions, providing security codes through texts as well as the FindMyiPhone app. As long as users are able to remember their password, they will have the ability to generate a new recovery key from the My Apple ID website. Enter your Apple ID and password and click "Sign In"
Type in the answers to your account security questions if you are prompted to answer them. You will see Two-Step Verification at the top of the page. Click on "Get Started" and follow the on-screen instructions. The option will be initially available in the United States, United Kingdom, Australia, Ireland, and New Zealand. Other countries will be added later.